The decision by Japanese Prime Minister Abe’s cabinet last week to reinterpret Article 9 of the Japanese constitution has been met with mixed reactions  in the region. In his address to Australia’s parliament earlier this week, Abe said that Japan ‘was more willing to contribute to peace in the region and beyond’. Significant analysis has been devoted to interpreting how those changes might affect ongoing tensions in the region. But in many cases that analysis has overlooked the implications the changes will have in enabling Japan to enhance its contribution to international peacekeeping efforts. Personnel from the Japanese Self-Defense Forces (JSDF) have been participating in UN peacekeeping operations since 1992. Since then, Japan has deployed over 10,300  personnel to UN peacekeeping missions in places such Cambodia, Mozambique, the Golan Heights, Timor-Leste and Haiti. As of May 2014, Japan currently has 271 JSDF personnel deployed to the UN Mission in South Sudan (UNMISS), making Japan the 45th largest troop contributor to UN peacekeeping. But while the JSDF has made an important contribution to UN peacekeeping over the last twenty years, its ability to engage effectively in such activities has remained limited by the heavy caveats in place as a result of the current constitutional interpretation. 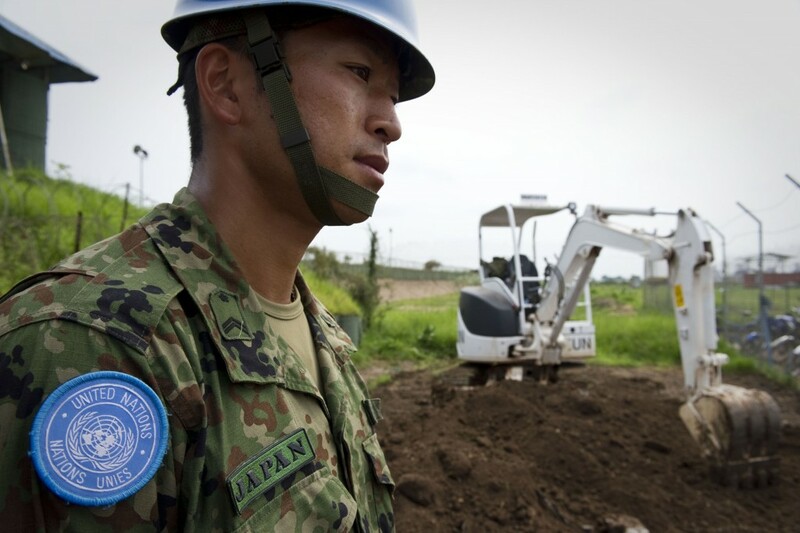 Any Japanese contribution to UN peacekeeping operations requires compliance with Japan’s 1992 Law Concerning Cooperation for United Nations Peacekeeping Operations and Other Operations (the International Peace Cooperation Law ). That law stipulates five principles for Japan’s engagement, including the need for a ceasefire to be in place, consent of the parties to the deployment, maintenance of strict impartiality and the minimal use of weapons. The nature of UN peacekeeping has changed significantly since the adoption of that law, yet the caveats on the JSDF’s participation haven’t. The UN continues to express concern  about countries applying national caveats to their participation in peacekeeping operations, noting that they constrain operations on the ground and make management of the mission difficult. Of course, Japan isn’t alone in placing national caveats on its contribution to peacekeeping operations—many countries have caveats in place that limit the engagement of their personnel, particularly in more volatile security situations. But Japan’s caveats surrounding the use of force are particularly restrictive. In some instances, the JSDF may not be in a position to fulfil core obligations of peacekeeping mandates, including protecting civilians or ensuring the safety and security of other personnel that might come under attack. It’s a worrying situation in contexts such as South Sudan, where the security environment has continued to deteriorate since December 2013. If Abe’s proposed changes pass the Japanese Diet later this year (as is expected), then it’s likely JSDF personnel deployed to UN peacekeeping missions will be in a better position to defend other personnel, protect civilians and contribute more broadly to the implementation of UN peacekeeping mission mandates. Although it may be some time until Japan makes any decisions regarding its existing peacekeeping commitments, the UN would view the decision favourably, especially when it’s struggling to generate suitably qualified military personnel  for new and existing peacekeeping missions. And if Japan decides to increase its commitment to UN peacekeeping operations, there are few countries (if any) in the region that could criticise it for doing so. China is currently the 13th largest contributor of personnel to UN peacekeeping operations, with more than 2,000 personnel deployed to 10 UN peacekeeping missions. Korea has over 600 personnel deployed, as do the Philippines, Indonesia, Malaysia and Fiji, which all sit within the top 40 troop and police contributors. And just this month, Vietnam deployed its first two peacekeepers to UNMISS. Far from drawing criticism, a decision by Japan to increase its commitment, along with the already high contributions from other countries in the region, could actually present opportunities to enhance regional defence cooperation and engagement. Training and capacity building for peacekeeping is an area that’s generally uncontroversial and unlikely to raise regional tensions. Australia has rightly welcomed  the opportunities that the Abe cabinet’s decision will present for Japan’s more active participation in UN peacekeeping operations. Since 2012, two ADF personnel have been deployed alongside  the JSDF contingent in South Sudan to provide liaison services and assist with mandate implementation. As Japan starts to consider its options for engagement in UN peacekeeping following the constitutional reinterpretation, Australia should consider how it might helpfully work with Japan in those efforts. That could include building on the model of cooperation already in place in UNMISS, or seeking to further cooperation within the region in the areas of peacekeeping training and capacity building. Both options are a win-win for the international community. Lisa Sharland is an analyst at ASPI. Image courtesy of the United Nations .